In 8-inch nonstick skillet, melt butter over medium heat. Stir in bread crumbs; cook 2 to 4 minutes, stirring constantly, until golden brown. Remove from skillet; set aside. In 12-inch nonstick skillet, heat oil over medium-high heat. Season chicken with garlic salt and lemon pepper. Cook chicken in oil 5 to 7 minutes, stirring occasionally, until no longer pink in center. Transfer to baking dish. 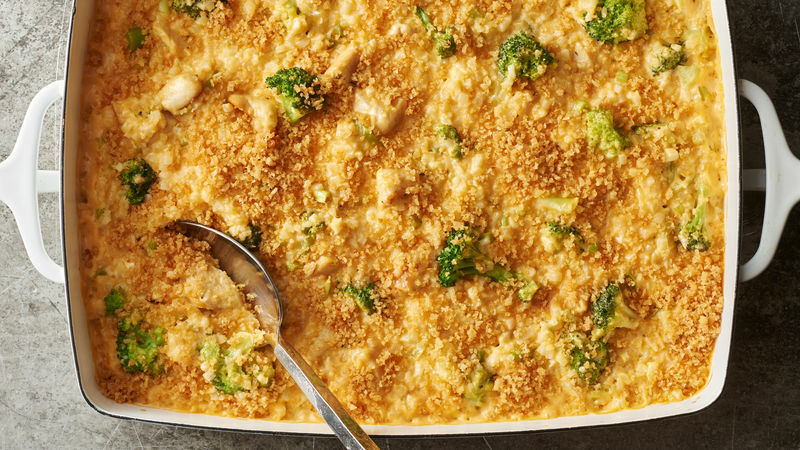 In same skillet, add frozen cauliflower and frozen broccoli; cover and cook over medium heat 14 to 16 minutes, stirring occasionally, until cauliflower and broccoli are just tender. Drain completely; add vegetables and green onions to baking dish with chicken. Meanwhile, in 2-quart saucepan, heat broth and cream cheese over medium heat 4 to 5 minutes, beating constantly with whisk, until completely smooth. Stir in Cheddar cheese; cook 1 to 2 minutes, stirring constantly, until cheese is melted and sauce is smooth. Pour sauce into baking dish; stir to combine. Bake 20 to 25 minutes or until bubbling around edges and completely heated through. Top with browned crumbs, and serve. Panko is a Japanese-style bread crumb that is crisper and slightly larger than traditional bread crumbs. Toasting the panko bread crumbs with butter in a skillet produces a crunchy texture that’s perfect for this creamy dish. Boneless skinless chicken thighs can be substituted for chicken breast.